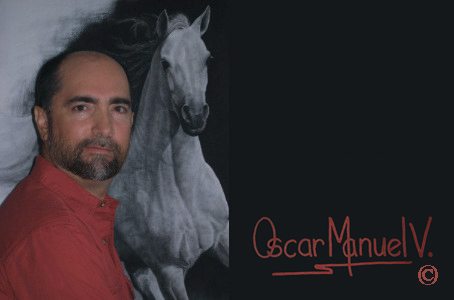 SELECTED SOLD ART : http://www.oscarmanuelv.blogspot.com. BORN; BOGOTA, COLOMBIA, SOUTH AMERICA. 2017, Tokyo Art Olympia International Competition, Living Treasure Museum Art Exhibition, Tokyo, Japan. 2016, YOUR CHOICE EXHIBITION, NAPLES ART ASSOCIATION, NAPLES, FL. 2016, CAMERA USA, NATIONAL PHOTOGRAPHY EXHIBITION AND AWARD. THE VON LIEBIG ART CENTER,NAPLES,FL. 2013, FACES & FIGURES, NATIONAL JURIED EXHIBITION, PUNTA GORDA, FL. 2012, CAMERA USA, NATIONAL PHOTOGRAPHY AWARD, VON LIEBIG ART CENTER, NAPLES, FL. 2012, ARTUP INTERNATIONAL, CITY OF BALTIMORE, BRITTEN BANNERS, MARYLAND. 2012, 2011, 2010, ART KUDOS INTERNATIONAL ART COMPETITION & EXHIBITION. 2011, ART INTERVIEW ONLINE MAGAZINE, INTERNATIONAL COMPETITION. 2011, SWFL ARTS COUNCIL WINNERS CIRCLE, PUNTA GORDA, FL. 2011. 2010, 2009, 2008, JAN AND GARY DARIO GALLERY, PALM BEACH STATE COLLEGE, LAKE WORTH, FL. 2010, 2000, BIENNIAL NATIONAL ART EXHIBITION, PUNTA GORDA, FL. 2009, 2ND ANNUAL ISAP ON LINE INTERNATIONAL EXHIBITION. 2009, BREVARD ART MUSEUM, MELBOURNE, FL. 2009, 2008 VON LIEBIG ART CENTER, NAPLES, FL. 2008, 1995, BOCA RATON MUSEUM OF ART, FL. 2008, 2007, 2006, ARTFORMZ , MIAMI, FL. 1999, 1996, 1995 WIZO ART, MIAMI, FL. 1999, 1996, 1994, 1993 THE SOCIETY OF THE FOUR ARTS, PALM BEACH, FL. 1998, 1997, 1994, 1993 MUSEUM OF ART, FORT LAUDERDALE, FL. 1997 FLORIDA STATE UNIVERSITY, TALLAHASSEE, FL. 1997 ART LEAGUE OF MANATEE COUNTY, INTERNAT. BRADENTON, FL. 1997 ST. PETERSBURG CENTER FOR THE ARTS, FL. 1997 CORNELL MUSEUM OF ART, DELRAY, FL. 1996 GULF COAST MUSEUM OF ART , LARGO, FL. 1994 THE ALLIED ARTIST OF AMERICA , NEW YORK, NY. 1994 WORLD TRADE CENTER, NEW ORLEANS, LA. 1994 THE DEPOSIT GUARANTY, INTERNATIONAL, JACKSON, MS.
1994 ART CENTER , HOLLYWOOD, FL. 1994 NORTON MUSEUM OF ART, PALM BEACH, FL. 1992 MUSEUM OF CONTEMPORARY ART, BOGOTA, COLOMBIA. 2005 CAESAREA GALLERY, BOCA RATON, FL. 2002 GALLERY CAMINO REAL, BOCA RATON, FL. 1997 FREYTES REVILLA GALLERY,BOCA RATON , FL. 1995 THE AMERICAS COLLECTION GALLERY, CORAL GABLES, FL. 2017, Tokyo Art Olympia Award Winner, Living Treasure Museum International Competition, Tokyo, Japan. 2012, GRAND PRIZE WINNER, ARTUP INTERNATIONAL , BRITTEN BANNERS. 2012, AWARD OF MERIT, NATHAN D. ROSEN MUSEUM INTERNATIONAL BIENNIAL, BOCA RATON, FL. 2011, ART INTERVIEW MAGAZINE, OFFICIAL RECOGNITION OF MERIT, HONORABLE MENTION. 2010, EXCELLENCE AWARD, JAN AND GARY DARIO GALLERY, PALM BEACH STATE COLLEGE, LAKE WORTH, FLORIDA. 2010, BEST IN SHOW AWARD, NATHAN DE. ROSEN MUSEUM INTERNATIONAL BIENNIAL, BOCA RATON, FL. 2009, BEST IN SHOW AWARD, VON LIEBIG ART CENTER, NAPLES, FL. 1997 ART LEAGUE OF MANATEE COUNTY, INTERNATIONAL COMPETITION. 1996 GULF COAST MUSEUM OF ART, ALL FLORIDA BIENNIAL. 1995 FLORIDA INDIVIDUAL ARTIST . 1995 BOCA RATON MUSEUM OF ART, ALL FLORIDA. 1994, 1993, BEST IN SHOW AWARD, THE SOCIETY OF THE FOUR ARTS NATIONAL COMPETITION. 1994 GOLD MEDAL, DEGAS PASTEL SOCIETY, NATIONAL COMPETITION. 1994 HOLLYWOOD ART CENTER ALL FLORIDA. 1994 BAILEY CONCERT HALL GALLERY SOUTH FLORIDA COMPETITION. 1979 BEST IN SHOW AWARD, EL TIEMPO NEWSPAPER, "NEW GENERATION" NATIONAL COMPETITION, COLOMBIA.